Judith Leifer-Bentz, a former member of the Martha Graham Dance Company, has worked with Bertram Ross, Lar Lubovitch and as a guest artist with Pittsburgh Ballet Theatre. She is co-founder of the Extension Dance Company and has had works commissioned by Physical Theatre Project, Brooklyn College, Selah Liturgical Dance, for sculptor Ann Elliot at the Carnegie Museum, as well as choreography for the Pittsburgh Playhouse. 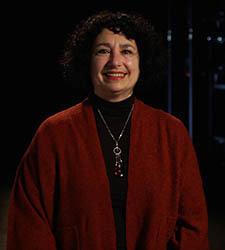 At Point Park, Leifer-Bentz has served as assistant or rehearsal director for Maxine Sherman, Joanna Mendl-Shaw, Peter DiMuro, Leslie Pessimier, Heidi Latsky, and Diane Gray for Martha Graham. She is the founder of the modern dance concentration, currently heads the modern dance unit and is head of the dance curriculum committee. She is faculty advisor to the department's Bridgework's series of student-choreographed works. Her most recent work, Interchange, was performed by the Conservatory Dance Company during the 2010-11 season. In March 2012, she and 13 dance majors traveled to New York City to perform Martha Graham's Heretic at the Joyce Theatre. The students performed as part of the Martha Graham Center for Contemporary Dance's first University Partners performance. She also facilitated the Dance Notation Bureau's notating of Heretic for their archives of master works. Leifer-Bentz has taught extensively in New York, at the Martha Graham School, American Dance Festival, Dance-West Virginia, Pittsburgh Ballet Theatre, Dance Masters of Pittsburgh and in Israel for Bat'Dor. She continues to study Pilates and keeps up with current dance performance trends by attending concerts and events. She also enjoys researching medieval and early renaissance culinary texts.